Although mobile phones have been around for more than a decade now, many charitable organizations have yet to take the mobile leap. Often times, these organizations are just not sure how best to implement a mobile strategy. "All too often, we meet with nonprofits that know what is possible through mobile technology, but they don't know what's necessary to achieve it. This can be daunting as technologists uncover the work and challenges involved in considering the many facets of building in mobile technology." It’s important to understand that mobile technology is only complementary to what makes your cause special. Mobile drives engagement, but it does not create it on its own. This means that your organization has to make sure donors are aware of what you’re doing with mobile, and that you’re doing your best to push it forward. This can be done by creating compelling marketing material, or even with add-ons like screencasting during a fundraiser. "Unfortunately, many nonprofits still haven't baked mobile thinking into their technology thinking. Reasons include lack of budget, time and technology leadership or expertise, or just not seeing a way forward." Being inexperienced with technology does not mean mobile is not right for you. Although charitable organizations often operate with limited resources, mobile solutions and services can be tailored to your organization’s needs while staying completely affordable and easy to use. "It is clear that mobile technology is the growing communication preference worldwide, whether through simple feature phones, smartphones, or tablets. Not every social good organization needs a mobile app, but it is imperative these organizations explore the potential of mobile technologies. The question isn't if an organization should be thinking mobile, but how will it go mobile, and which paths it should take to scale or increase its reach." 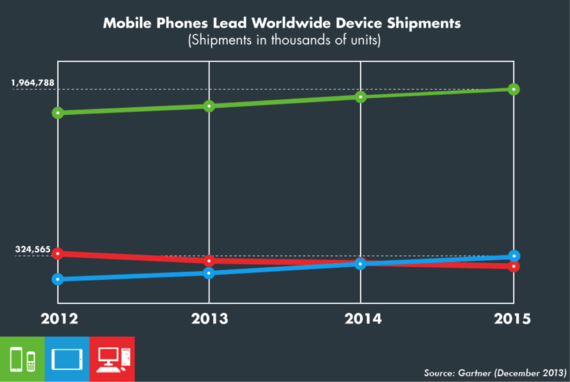 Mobile isn't going anywhere, in fact it's still rapidly growing. If everyone in your audience has a mobile phone, why not use that to your advantage? By offering a mobile fundraising option, your supporters will be able to make fast and easy donations to your cause, in real time. You will find that this kind of proximity with your donors is quite valuable.